Today I want to focus on one of the key rooms in the house to get (and keep) organised – the kitchen. Kitchens are notoriously hard to keep organised because there is so much stuff being used so often that nothing tends to stay put for very long. 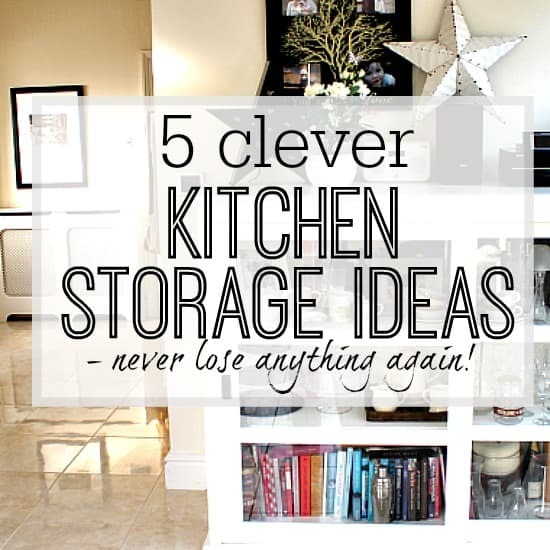 Without having the right storage set up things can get messy very quickly, and that’s why I wanted to look specifically at some clever kitchen storage ideas that will really help to keep things under control. As such, here are my top 5 ideas found from all over the web (and of my own of course!) to give you inspiration when organising your own kitchen. I am sure there will be something new for you to try, and hope that it makes a real difference. I always like to make sure that all space is used as much as possible, especially when you are short of storage. 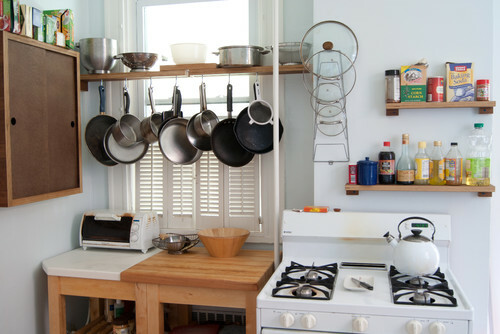 The perfect example of this is to add extra shelving and/or hooks to areas that would otherwise be wasted. This is a good example of using what doesn’t seem to be an area that would be good for storage i.e. the window area, and creating storage there. Other ways to use this idea is to add extra shelving and hooks to the inside of cupboards, especially where the shelves are far apart and therefore the height isn’t being maximised. We are not always fortunate with the kitchen that we have in our home, and usually we inherit it from the previous owners. As such, it’s always a good idea to look at some free standing options, as this can add your own character, extra storage space, and even extra work surface if needed. A larder style unit could have glass doors or hidden doors, but can keep all your food in one area, and is really useful for being able to see everything you have in one go. I always try and put all food together when organising a kitchen if at all possible, whether it be a free standing unit like the one above, or a set of fitted cupboards like in my own space. A dresser gives plenty of storage and display for all the glassware and crockery for your home – freeing up valuable hidden storage space in the actual kitchen units (where you can hide away food items and things you don’t really want to see as much). The above picture is my own dresser which I put on a spare wall in my kitchen (actually, its just the top half of the dresser as the ceiling was slightly too low to accommodate the whole thing, but I quite like this as it’s quirky!) 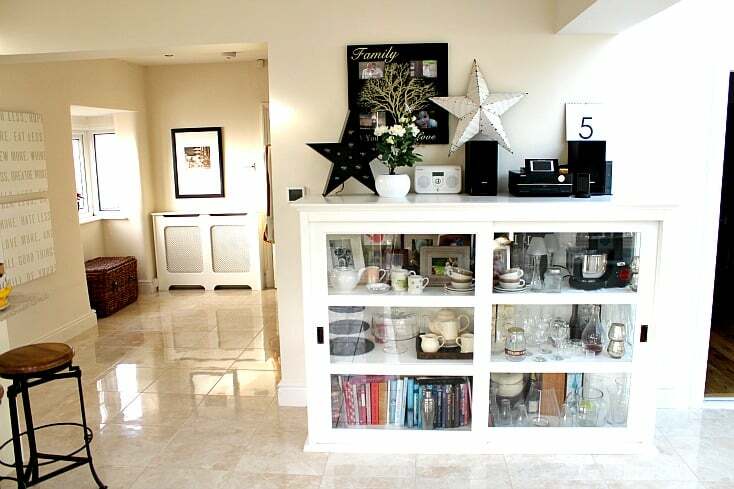 – I love to be able to store and display all my nicer items, and my recipe books etc… and have plans to update this area of the kitchen still further this year so watch this space for more ideas! 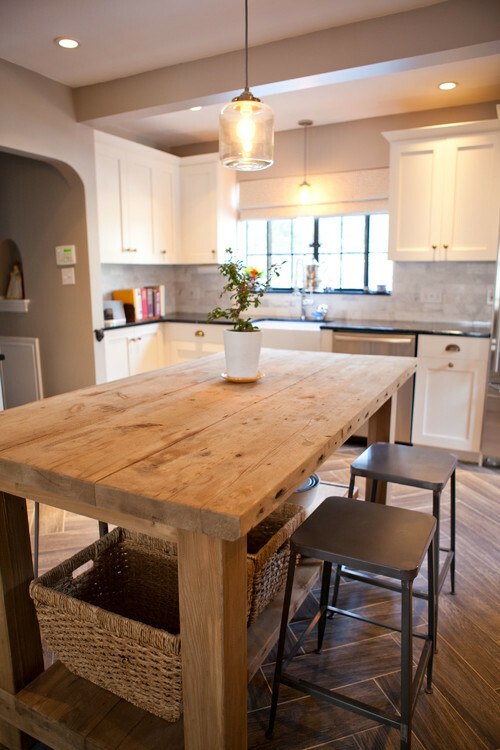 This is a great example of a table that has been placed so that it can be used for seating, extra work surface, and also houses extra storage underneath. Whether you choose to have more hidden storage in terms of drawers and cupboard space, or open like this, it can be a great solution for wasted space in the centre of the room. This article on The Top 5 Kitchen Trends to watch in 2016 has rated storage as an essential to build into your kitchen, and if you have the budget to add in some fitted storage (or are thinking of updating your kitchen this year), then it’s definitely worth a look. Firstly – I love how the pull out unit they feature has everything you would usually have cluttering your work surface all hidden away but still totally accessible for day to day living (knives, utensils etc..). Perfect! Secondly – the basket drawers would be handy not only for fruit and veg that have to be stored as such (which in themselves would be perfect as there would be no need for a fruit basket or other storage on your work surfaces), but could also be used for a variety of items in the kitchen that you need to grab quickly such as tableware, recipe books and even food like snacks or regularly used ingredients. #4 – Think outside the box – literally! I love this as you can add a small crate/box to your work surface really easily, giving extra shelf space. The use of hooks both on the side and inside the crate gives even more storage so that no area is unused. #5 – Lazy susans are the best kept secret! I am in love with using lazy susans as they can provide accessibility to difficult to reach areas, and are especially good for corner units/shelves, high shelves where you can’t see the back very well, or for ensuring taller units make the most of the height as well. For a couple of examples, take a look at my baking cupboard and my herb/spices storage solutions, and they show how useful they can really be. What I love about all storage is that you can tailor it to your needs – so never think that something has to be used for it’s correct purpose. Look firstly at the space you have available, what you want to store in that space, and how accessible it is, and then choose your storage based on these. You won’t go far wrong if you follow these guidelines, and I really hope that the ideas above have given you a little inspiration along the way. 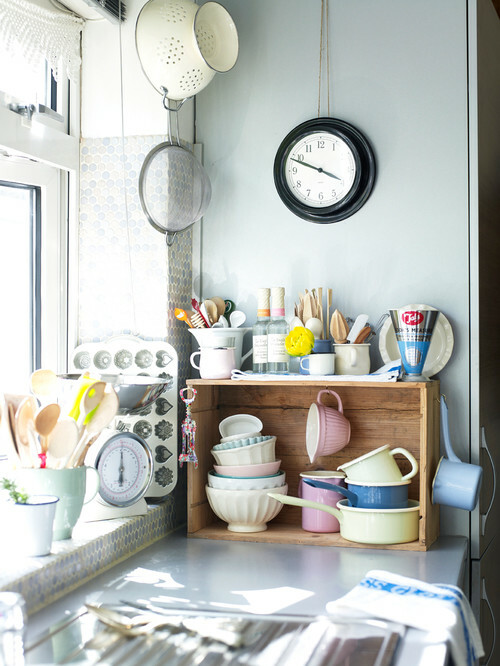 If you have any clever kitchen storage ideas that work for you in your kitchen and you would like to share them, then please leave a comment below – I’d love to feature it! 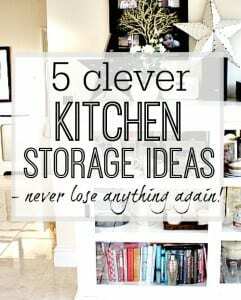 I would like to thank Betta Living for collaborating with me on this post – I love finding great storage ideas and this has been a topic requested from readers for a while now. If you would like to find out more about Betta Living then please CLICK HERE. As always all words/views and ideas within this post are my own. For more details please see my disclosure page. Hi Chrissy, I’m really enjoying your articles and I’ve already got some inspiration and solutions! In the last place where I lived, the tiny cupboards of my tiny kitchen weren’t big enough for my plates, and I used to keep them in a basket on the counter (lots of counter space, curiously). But it wasn’t the most comfortable plan, and I bought a pine shoe rack that I placed on the counter. It housed and displayed all my crokery. I made an organza case to protect it from dust (and at the same time still let as much sunlight in as possible through it), leaving a separate panel on the front for easy access to the contents.